Son of William Sykes, an iron foundry labourer. He initially worked as an errand boy in Alderman William Nicholson's drapery business. He later worked as a grocer with George Fawell & Sons Ltd before joining a small group of businessmen who took over Hampsons confectioners, then becoming a director of that company. Represented Halliwell Ward from 1921. 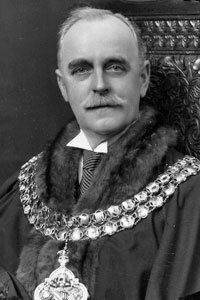 Alderman 1930. He was Chairman of Parks and Cemeteries 1933-36, 1940-1944 and 1950-54. His Mayoral speech called for "open spaces and more of them!". He served in the First World War as a Special Constable and was awarded a King's Medal for his services. 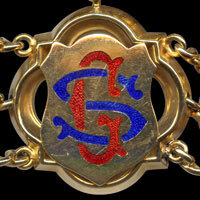 He was an official in the Halliwell Conservative Association from an early age and was their Treasurer in 1897. He was President of Bolton Conservative Club and founder of the Bolton Junior Unionist Association. He was a great campaigner for cremation and laid a foundation stone at Overdale Crematorium in 1954. He also had a great interest in mental health and was on the Committees of Winwick and the Royal Lancaster Mental Hospitals. He retired in 1955. Not surprisingly, when he died, he was cremated at Overdale. His wife, Mary, the Mayoress, was also Treasurer of Halliwell Women's Conservative Club. 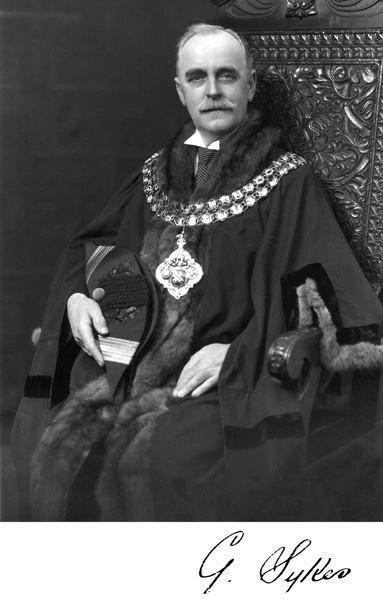 Formal portrait of George Sykes as Mayor of Bolton. George Sykes' link on the Mayor of Bolton's Chain of Office.